This lovely old farmhouse sleeps 7. The accommodation consists of 3 bedrooms and a bathroom upstairs, 2 doubles and one 3-bed room (suitable for children) The latter is not private as you have to go through it to get to one of the double rooms. Downstairs there is a well-equipped kitchen large enough to eat in, a shower room, utility area and a very large living area with a fireplace and seating at one end and dining table at the other, with a brick and stone arch in between. A long terrace at the front of the house is shaded by a pergola and has a large table which seats 8/10 people. To the side of the house beside the old chestnut house and bread oven is a purpose built brick barbeque. 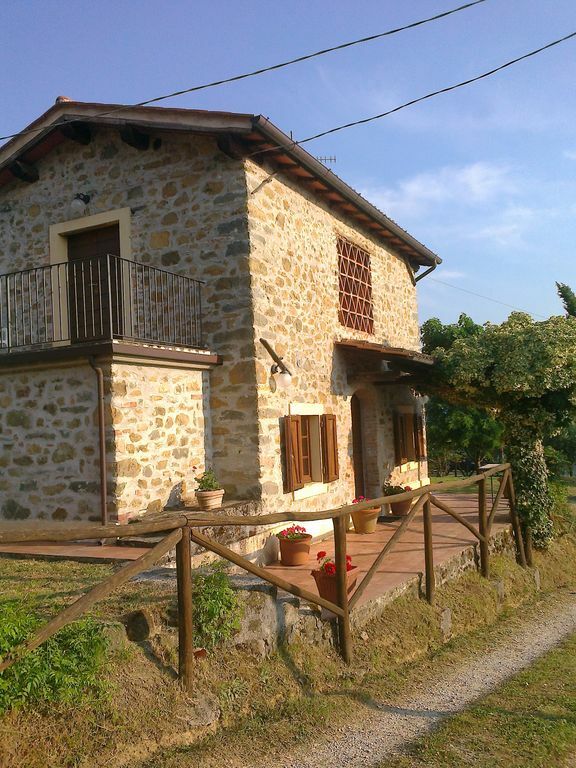 Situated on a spur of the Appenines, this recently restored family owned farmhouse and converted barn stand on 2 acres of tranquil olive grove and meadow, 2 km from the picturesque old walled town of Barga, which has all the shops necessary for daily living. The rooms are simple but comfortably furnished, with terra-cotta floors and chestnut beamed ceilings. Each house has a large terrace shaded by a pergola and the views are spectacular in every direction. Buvicchia: Buvicchia is very quiet, a wonderful spot to get away from it all as we have been doing for over 30 years. Barga has all the shops needed for daily living and there are many good and inexpensive restaurants in Barga and the surrounding area. Lucca, a spectacular walled town, is 40 mins away, Florence an hour and a half, Pisa just over an hour, and the railway is 7 km away for trains to Lucca and beyond or up into the high Garfagnana. The sea is just over an hour away also. A car is very desirable and car hire is available via the major companies at Pisa airport. The Farmhouse: Built in 1740 as a small two-roomed farmhouse, Buvicchia 3 was added to over the following decades to include a large 'cantina' or winestore (now the sitting room) with bedrooms overhead. Right up to 1972 there were earth floors downstairs, no electricity and just one cold tap in the kitchen! Two restorations later, the farmhouse now has all the necessities for daily living but the atmosphere has not changed. You can still imagine it as the home of a subsistence farmer through two centuries. The adjacent barn: Built in the 1860s, converted in 1974 and fully restored in 2004, this converted barn sleeps 2. We have preserved as much of the character as possible by leaving the first floor almost unchanged (that's where the hay was!) and the ground floor open plan also. A terrace at the front and a second one in the garden both look out on wonderful views. This is a real hideaway, a place for total relaxation. Both bathrooms were installed in 2000, bright and cheerful with terracotta floors and white tiles. We are currently trialling wireless internet at the property. Please contact the owner for more details. The living room has a generously sized two-seater sofa and several comfortable cane chairs. Tall refrigerator with small freezer unit. The kitchen is equipped with a five-ring gas hob and electric oven with extractor fan, as well as the usual cupboards of crockery and pans, a sink, fridge freezer and dishwasher. There is a small collection of DVDs for viewing at the property. There is a large shaded terrace with a wisteria pergola facing west. The house is not suitable for infirm people as all the bedrooms are upstairs, but many active not-so-young have been very happy there. The shower room (with bidet, basin and loo) is downstairs, the bathroom (ditto) is upstairs. Bed linen can be provided (for a small charge) or you can bring your own. I know we're taking liberties calling it "our place" but it feels like home whenever we stay. Going back 33 years(!) this was our third visit. The house and barn (capanna) are so clean and have everything you would need. The position in relation to Barga is close enough to feel you're near amenities, but far enough away to feel you're really escaping. It's the perfect place for relaxing and reading. We took all our grown up kids and their partners this time round, if it's still for hire it wouldn't surprise me if they are still going back in another 33 years! Highlights of this visit - wild swimming in the Lima just east of Bagni di Lucca, Lucca and Pisa day trips, eating out on the terrace in the evening (I think we were too late this year for the fireflies) and Cecchi Chianti at Conad EU4.99 a bottle....We can't recommend this place highly enough. We arrived in afternoon by taxi from railway station and as we turned into the drive we were taken aback at our lovely barn and the magnificent views. the accommodation was great and a lovely touch was the little hamper of groceries and wine. We had been travelling around for the previous week and decided we would cook up and sat on the western terrace in the warmth of the evening watching the sun setting on the old town of Barga. our Barn was so comfortable with three terraces in which to laze around. we sat surrounded by mountains and lovely countryside. The old and new town of Barga had anything you would need. we enjoyed the walk to the town stopping off in one of its many little cafés and bars for a beer or coffee. Our favourite restaurants were Ristorante Albergo, Capretz and L'Osteria. the food was excellent in them all and they were good value. This spot would be a great place for anyone wishing to walk in the surrounding mountains. We had a great week relaxing at Buvicchia. We have visited this property on two occasions and hope to return again soon. The accommodation provides you with everything that you could possibly need to enjoy a comfortable and restful holiday in this beautiful countryside. The views from the houses are breathtaking, with spectacular sunsets-a great spot for sketching or photography. The area around the properrty is very peaceful and the locals are friendly and helpful. Barga itself is a charming little town and has everything you need close by-supermarket and a weekly market, as well as fantastic restaurants. The evening walk into town for dinner is a must and the moonlit walk home (complete with fireflies at the right time of the year) is a perfect end to a very relaxing day. Wir haben wundervolle Ferien verbracht in diesem geräumigen, schön eingerichteten und sorgfältig renovierten Bauernhaus. Einer der seltenen Fälle, wo alles vor Ort genau der Beschreibung entspricht. Und nicht zuletzt die Kommunikation mit Carol, der Vermieterin, die alles bestens beschrieben hat (auch die nicht ganz einfache Anfahrt) und uns mit einem Willkommensgeschenk überraschte... Vielen Dank für alles! Wir hoffen, bei Gelegenheit wiederkommen zu können! Barga is situated 40 kilometres north of Lucca at the southern end of the spectacularly beautiful area known as the Garfagnana which sits between the Apuan Alps and the Appenines in the very north of Tuscany.